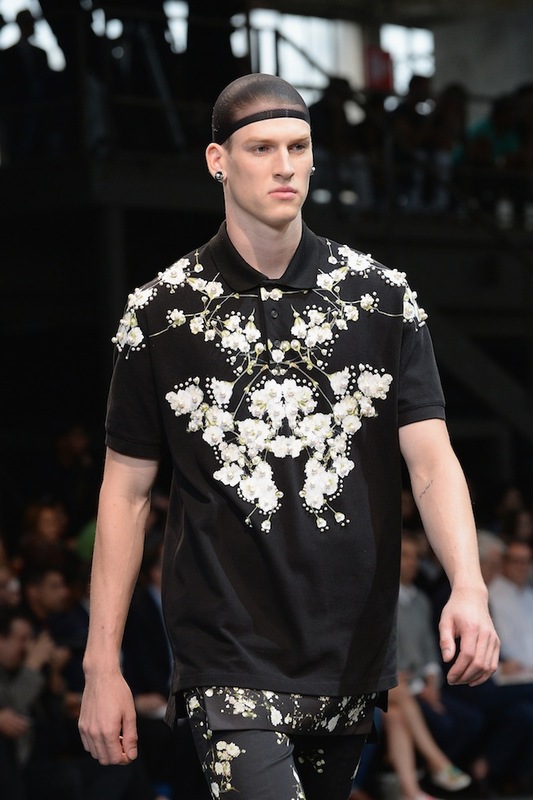 It's pretty clear that Riccardo Tisci draws a lot of inspiration from hip-hop and black culture for his designs. His street sensibilities mixed with gothic and high fashion proclivities have made Givenchy one of the most popular brands in hip-hop–and it doesn't even have a song with an annoying refrain dedicated to it…at least, not yet. (A$AP Rocky, your move). And while we love that Riccardo brings 'round the way fashion to the Paris runway, there are certain hip-hop trends that are better left in the past. Like for example, do-rags. After the world suffered through their ubiquity in the 90s and early aughts, we thought we would never see do-rags again. Tailored suits and skinny jeans replaced oversized throwback jerseys and baggy jeans, leaving the do-rag looking out of place with the streamlined, tailored aesthetic that was becoming popular thanks to Jay Z and Kanye West. But Tisci must be feeling very nostalgic for the year 2002, because for his Spring 2015 menswear collection, he sent models down the runway in stocking caps that are giving us serious high fashion do-rag vibes, and we are NOT into it. The clothes? Oh, those are fantastic as usual, but knowing Riccardo's penchant for starting trends…and Kanye West's eagerness to outfit himself with quirky runway accessories, we think this whole stocking cap thing is a sleeping giant of a trend just looking for the right opportunity to come back and annoy us. So, from us to you, Mr. Tisci, please, please don't make do-rags a thing again. We were doing so well without them.